[116 Pages Report] The overall eSIM market was valued at USD 179.6 Million in 2017 and is estimated to reach USD 978.3 Million by 2023, at a CAGR of 31.0% between 2018 and 2023. In terms of volume, the overall eSIM market is estimated to register a shipment of 287.7 million units in 2016 and is likely to witness a shipment of 1,168.8 million units by 2023, at a CAGR of 32.4% between 2018 and 2023. The growth is attributed to the emphasis on remote SIM provisioning for M2M, favorable government regulations boosting M2M communication, and high adoption of IoT technology. The base year considered for the study is 2017, and the forecast period is between 2018 and 2023. The objective of the report is to provide a detailed analysis of the eSIM market based on application, vertical, and geography. The report provides detailed information regarding the major factors (drivers, restraints, opportunities, and challenges) influencing the growth of the eSIM market. The report also gives a detailed overview of the value chain pertaining to the eSIM market and analyzes the market trends. The research methodology used to estimate and forecast the eSIM market begins by capturing data on key vendor revenues through secondary research. Secondary sources include IEEE journals, automation world magazines, manufacturing automation magazines, and leading players’ newsletters. Vendor offerings are also considered to determine the market segmentation. The bottom-up approach is employed to arrive at the overall size of the eSIM market from the key players’ revenues. After arriving at the overall market size, the overall market is split into several segments and subsegments. Thereafter, these are verified through primary research by conducting extensive interviews with people holding key positions in the industry, such as CEOs, VPs, directors, and executives. Market breakdown and data triangulation procedures are also employed to complete the overall market engineering process and arrive at the exact statistics for all the segments and subsegments. The breakdown of the profiles of the primaries is depicted in the following figure. The value chain pertaining to the eSIM market starts with research and development, manufacturing, system integration, supply and distribution, and post-sales services. The most important steps in the value chain of the eSIM market are R&D, manufacturing, and system integration. End users of embedded SIMs include various consumer, commercial, and industrial verticals. Some major suppliers of eSIM systems are Deutsche Telekom AG (Germany), Gemalto NV (Netherlands), Giesecke & Devrient GmbH (Germany), Infineon Technologies AG (Germany), NTT DOCOMO, INC. (Japan), NXP Semiconductors N.V. (Netherlands), Sierra Wireless, Inc. (Canada), Singapore Telecommunications Limited (Singapore), STMicroelectronics (Switzerland), and Telefónica, S.A. (Spain). 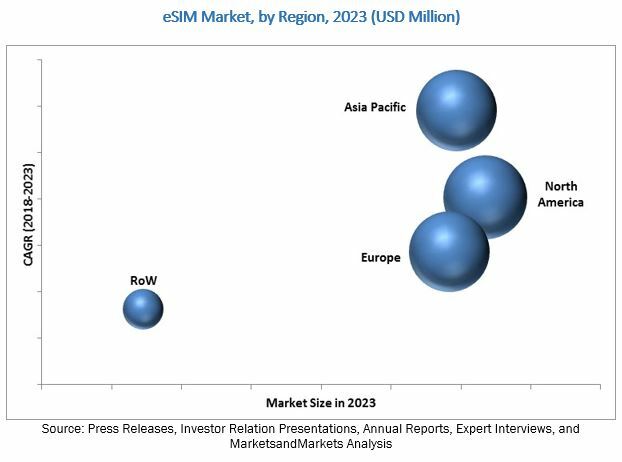 This research report categorizes the global eSIM market by application, vertical, and geography. With the given market data, MarketsandMarkets offers customizations according to the specific needs of companies. The following customization options are available for the report. The overall eSIM market is estimated to grow from USD 253.8 Million in 2018 to USD 978.3 Million by 2023, at a CAGR of 31.0% between 2018 and 2023. The emphasis on remote SIM provisioning for M2M, favorable government regulations boosting M2M communication, and high adoption of IoT technology are driving the demand for eSIM solutions. ESIM is useful for applications in which settings are required to be remotely updated, has the capability to bypass the form factor issues, and enables easy manufacturing and deployment of several IoT devices and sensors. Presently, the global eSIM market is in its nascent phase. With the steady adoption of the IoT technology across various industries, the overall eSIM market is likely to gain traction in the coming years. The M2M application is estimated to lead the eSIM market in 2018. The increasing penetration of the internet, coupled with the rising adoption of IoT across verticals such as automotive, consumer electronics, energy & utilities, manufacturing, retail, and transportation & logistics, is primarily driving eSIM adoption. In addition, favorable regulatory frameworks are facilitating the growth of M2M across verticals. ESIM is now a mainstream technology in the M2M application. It plays a pivotal role in this application owing to its remote programmability and high security. The rapidly growing M2M market across verticals is expected to contribute to the dominance of M2M application during the forecast period. However, the lack of standardization in connectivity protocols is expected to hinder the eSIM market growth. Based on vertical, the telecommunications vertical is anticipated to witness the fastest growth during the forecast period. The telecommunications vertical remains one of the major forces shaping disruption, innovation, and growth across various technology industries. ESIM is anticipated to be a game changer in telecommunications applications. It aids in intelligent switching of operator profiles without any hassle to the end user, with no geographical border constraints. The adoption of eSIMs by telecommunications stakeholders is likely to position them as leading players in connectivity and IoT markets in the coming years. Europe is estimated to hold the largest share of the eSIM market in 2018, followed by North America and Asia Pacific. However, by 2023, North America is likely to hold the largest market share globally. The increasing focus on the linking and digitization of future products and services is boosting the growth of the semiconductor industry. The semiconductor industry offers key technology solutions such as security, energy efficiency, mobility, and smart grid, across verticals. Furthermore, semiconductors are viewed as building blocks for enhanced environmental monitoring, energy efficiency, and better security. It is one of the most R&D-intensive industries in Europe. The demand for eSIMs is likely to gain momentum in the near future owing to the rapid adoption of advanced technologies, changing consumer demographics, as well as shifting consumer preferences. ESIM cards allow remote provisioning of SIM profiles through enabling automatic interoperability between connectivity platforms and multiple SIM operator profiles. However, the operational flexibility achieved by an embedded SIM would be a futile effort if security is compromised. The eSIM collects and stores the credentials of mobile network operators (MNOs) in the inbuilt software of the device, which is prone to various security hacks. In addition, it operates through multiple MNOs and physical platforms, thereby exposing it to the risks of the virtual environment. Major players operating in the eSIM market include Deutsche Telekom AG (Germany), Gemalto NV (Netherlands), Giesecke & Devrient GmbH (Germany), Infineon Technologies AG (Germany), NTT DOCOMO, INC. (Japan), NXP Semiconductors N.V. (Netherlands), Sierra Wireless, Inc. (Canada), Singapore Telecommunications Limited (Singapore), STMicroelectronics (Switzerland), and Telefónica, S.A. (Spain). Key market players focus on acquisitions, collaborations, joint ventures, partnerships, and product launches and developments to enhance their product offerings and expand their businesses.